Wander a whole summer if you can. Time will not be taken from the sum of life. 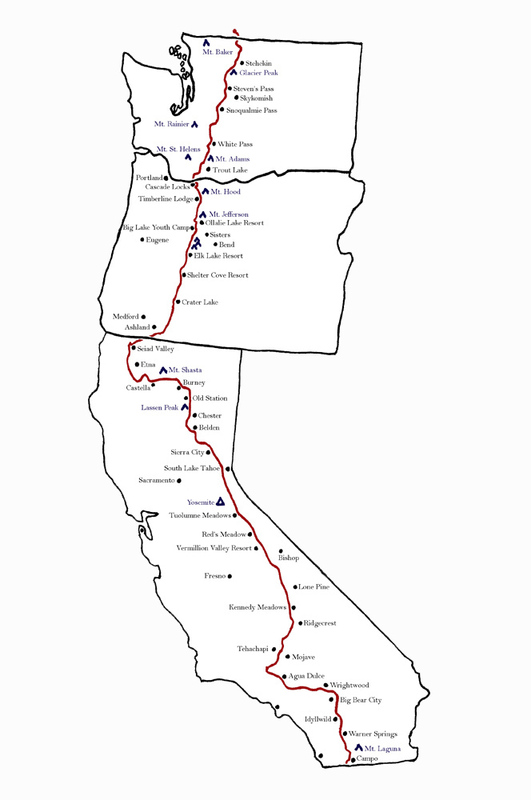 The Pacific Crest Trail (or the "PCT") is a 2,650 mile long trail that extends from Mexico to Canada, passing through California, Oregon and Washington along the way. Like its sister hike, the Appalachian Trail (or the "AT"), it is a long distance journey that many backpackers attempt to complete in one season each year. The PCT journeys through low valleys, high mountain ranges, sand, snow, wind, rain, lush forest and arid desert. Along its route it travels through seven national parks, and every eco-system but one. It is best traveled between late-April to early October, in order to avoid the harsher winter conditions that can make crossing the mountain ranges more difficult. Most people hike from South to North for just this reason: weather. Each year approximately 500-800 people attempt to thru-hike the trail, with only 30% of those actually finishing the entire route. In 2013, the year I hiked, there were over 1,300 long distance permits applied for! In total, about 400 of those people completed the whole trail end to end. I was one of those lucky few who spent an amazing summer walking from Mexico to Canada, and enjoyed the memories that such an adventure brought me. By reading my journal below, you can join me on my journey. Click on each section of trail to read the journal entries. How do you navigate on the PCT? What did I eat on the PCT?